This violent saga takes place in a world mixing modern technology with traditional Japanese culture. Afro Samurai seeks nothing more than revenge on the maniacal murderer who beheaded his father in front of his eyes as a child. Afro Samurai will cut down anyone in his path as he seeks Justice. 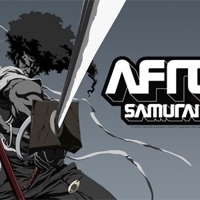 4230 users rated Afro Samurai [TV].